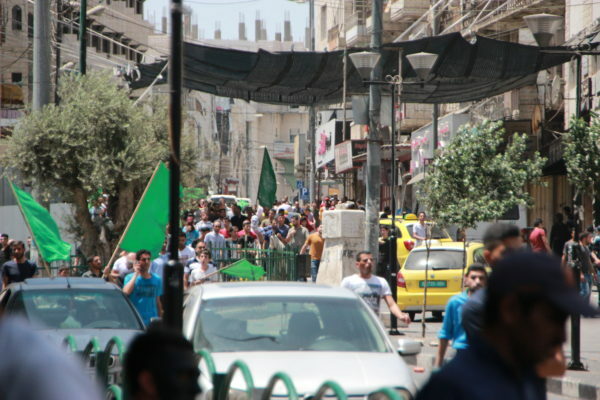 An Al-Aqsa solidarity march organized this Friday in occupied Hebron was heavily repressed by Israeli Forces. Soldiers and border police fired stun grenades, teargas, putrid-smelling “skunk” water, rubber-coated steel bullets and live ammunition at demonstrators, injuring many. Several young protesters were also beaten and detained. The Al-Aqsa solidarity march started from the Al-Hussein Mosque and continued on Ain Sarah street towards Bab Al-Zawiya towards Israeli controlled H2. Even before the march reached Bab Al-Zawiya, an Israeli video drone was seen flying above the scene and soldiers were getting ready on the other side of Shuhada checkpoint to face the demonstrators. 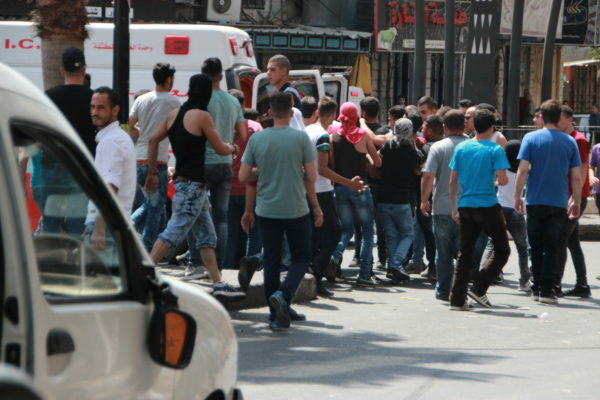 The march reached Bab Al-Zawiya around 1:30 pm, at which point the Israeli forces came out through Shuhada checkpoint, which separates Palestinians from Shuhada street, and forcing some of the demonstrators ran to Wad al-Tofah Street, while others withdrew to the adjacent Ain Sarah street. Israeli forces followed the demonstrators down Wad al-Tofah street, firing rubber coated steel bullets indiscriminately at young boys and men. A skunk truck also drove down Ain Sarah and sprayed chemically treated skunk water on houses of uninvolved Palestinian civilians. A standoff ensued in which demonstrators lit tires on fire and a young boy was shot in the leg with live ammunition, before being quickly taken to hospital. Israeli forces eventually withdrew from the scene. These areas are located in the H1 area, supposedly under full Palestinian control. The demonstrators moved up Ain Sarah, and once the protest seem to calm down the Israeli forces started shooting at demonstrators. 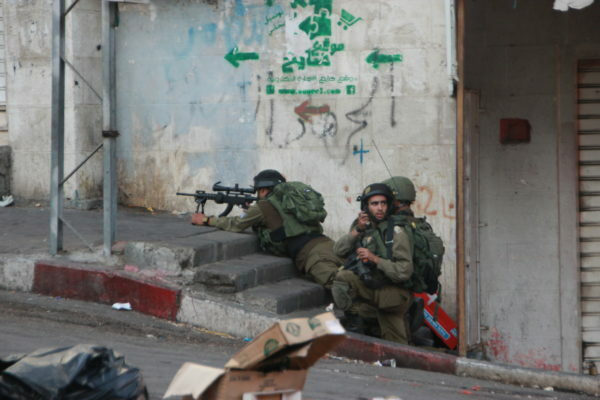 At this point two more Palestinians were shot and injured. Israeli police and soldiers drove further along Ain Sarah, got out and started chasing the demonstrators. At 14:46 they detained a minor who, after being pulled down, was beaten down on his head and kicked on his back. Protesters withdrew down Ain Sarah, pursued by police and soldiers firing rubber-coated steel bullets and showers of teargas. 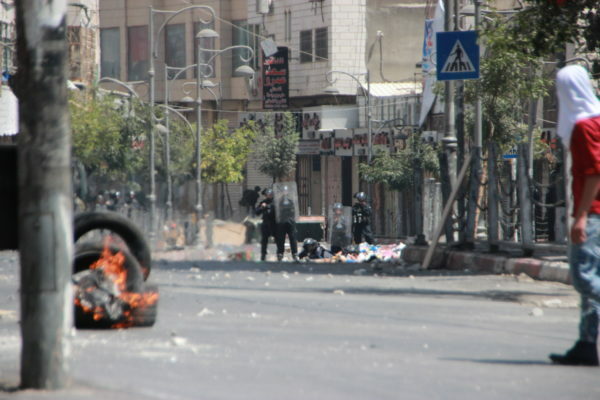 As the soldiers seemed to withdraw towards the Bab al-Zawiya area again, the demonstrators followed them and some started to throw stones and light up tires. The Israeli forces promptly responded with stun grenades, tear gas and rubber-coated steel bullets. The Israeli soldiers also broke into a shop in Bab Al-Zawiya, leaving an explicit note. 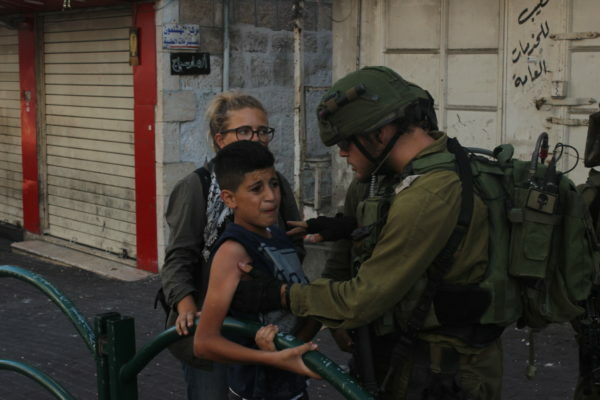 After violently detaining a 15-year-old boy, they took him into the building, blindfolded him and then transferred him through Shuhada checkpoint. After this, the army returned again to attack the demonstrators. 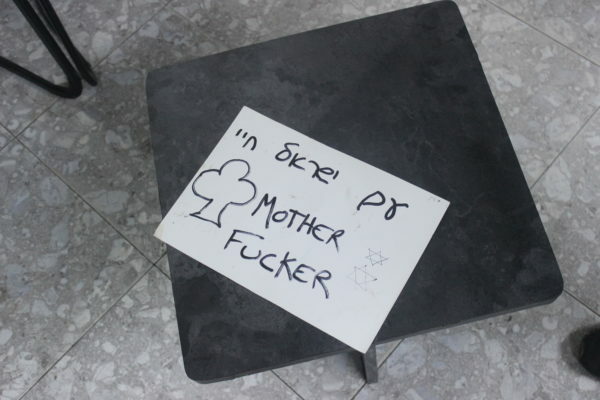 Note left by Israeli soldiers in a shop that they had broken into in Bab al-Zawiya. The Hebrew states ‘Israel lives’. One of the following attacks forced the group of young men and teenagers up the hill north of the entrance of the vegetable market. Soldiers positioned on the roof of the nearby building threw teargas and stun grenades towards the demonstrators. With around 50 border policemen in the back and support from a sniper lying at the entrance of the street, a troop of 12 soldiers went up the hill, trying unsuccessfully to break into a building. They proceeded to throw teargas and stun grenades at a group of four activists who were taking photos nearby. At the intersection at the end of the road protestors were showered in teargas and the crowd dispersed. Amidst the teagas fog a teenager, thought to be around 14 to 16 years old was shot, presumably by the sniper down the road, and was evacuated in the car of a passerby. After this incident the soldiers went back down and disappeared from Bab Al-Zawiya. 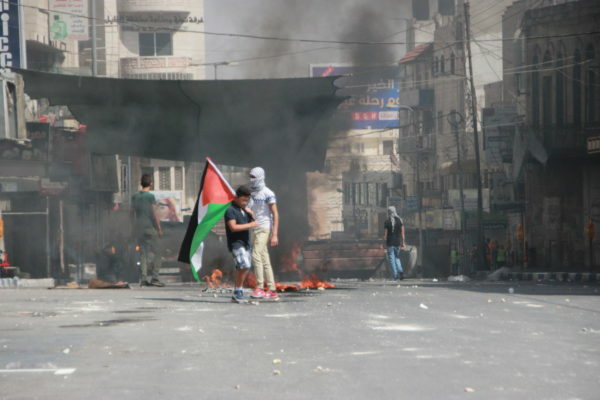 The clashes lasted altogether around four and a half hours during which the Israeli forces displayed unnecessary and excessive violence not only towards demonstrators, but also towards the media. 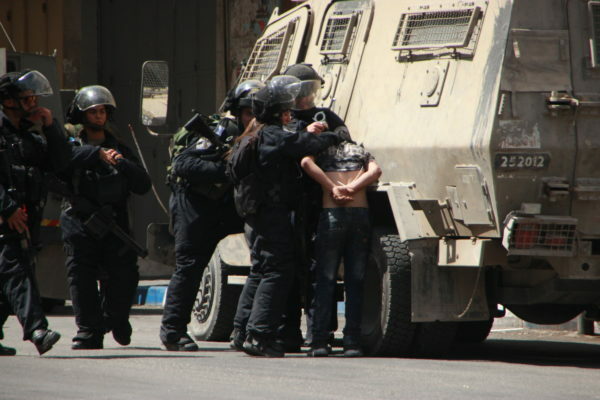 The army seemed out of control, breaking into Palestinian offices in Bab Al-Zawiya, demonstrating violence and intimidating journalists, targeting children and beating up demonstrators who were already detained, and not resisting arrest. The demonstration was in solidarity with the demonstrations in Jerusalem against the new access restrictions introduced by Israel at the Al-Aqsa compound. The Palestinian community had earlier called for a ‘day of rage’ in response to the restrictions, which Israel described as ‘security measures’. More from the International Solidarity Movement (ISM).